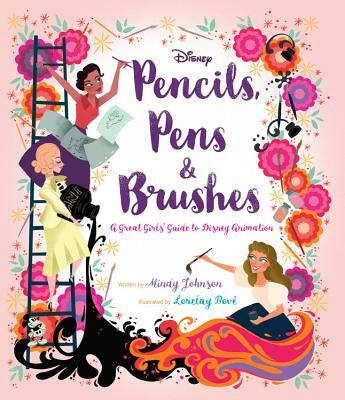 Based on Mindy Johnson's critically acclaimed Disney Editions title, Ink & Paint: The Women of Walt Disney's Animation, this nonfiction picture book is a fun and inspiring look at many of the amazing women who have worked at Disney Animation over the years-from Story Artists, to Animators to Inkers and Painters, all with unique personalities and accomplishments, such as becoming a record-holding pilot, or designing Hollywood monsters, or creating an international club for tall people! Award-winning author, historian, filmmaker, educator, musician and more, Mindy Johnson's creative accomplishments reflect the diversity of her talents and experience. A leading expert on women's roles in animation and film history, Mindy frequently writes and speaks on early cinema, animation, women's history, and creativity. Her ongoing research and groundbreaking discoveries continue to cast light on the invisible narrative of women's presence within the first century of the motion picture industry. Lorelay Bové was born in Spain and raised in the Principality of Andorra between France and Spain. She moved with her family to Los Angeles when she was 14 years old and is fulfilling a childhood dream of being an artist at the Walt Disney Animation Studios. Her inspiration includes her father who is an artist in his own right, as well as her tight knit family, Disney classic films, old Hollywood movies, her native Spain, and her travels. Bové has also illustrated the Toy Story picture book, The Princess and the Frog Little Golden Book, the Wreck-It Ralph Little Golden Book, the Monsters University Fearbook picture book, and the Disney Animation Studios Artist showcase series title, No Slurping, No Burping.